Published: March 8, 2016 at 05:01 p.m. Updated: March 9, 2016 at 01:29 a.m. The elite of the Y2K era are hanging 'em up left and right. There was Patrick Willis last March. Charles Woodson told everyone he was done at the end of December. Beast Mode tweeted his epic farewell in February. Then we watched Peyton Manning's formal announcement Monday. And now, Calvin Johnson has joined the club. The front-page news Tuesday, that one of the scariest wide receivers to ever lace them up was calling it quits, inspired me to jot down the top 10 wideouts of all time -- all eras included. Let's celebrate the true elite at one of pro football's most glamorous positions. "He was so technically defined. ... The guy had unbelievable hands," says NFL Media analyst Gil Brandt, who saw Berry transform the position of wide receiver in person. Berry attacked the game cerebrally, calibrating the proper steps and spacing that are so integral to the modern route tree. Essentially, Antonio Brown owes a little something to the former Baltimore Colt, who, by the way, was a two-time NFL champion and a first-ballot Hall of Famer. His knack for the details stuck with him even after he was hired as an assistant coach in Dallas. Brandt recalls Berry telling him that their practice field wasn't wide enough. "I told him, 'No, it's not too short,' " Brandt says. "Then, we actually measured it, and it was six inches short!" Berry played wideout like another Colt played quarterback -- Peyton Manning. He edges out James Lofton, Michael Irvin and Andre Johnson, among others. Much has been made of Harrison making it into Canton before Terrell Owens, but the reality is that decision had more to do with the fact Harrison had already been waiting two years, while this was T.O. 's first year of eligibility. Harrison was as consistent a wide receiver as you will ever see. His career took off during Peyton Manning's second year; from that season until 2006, he posted 1,000 yards and 10 touchdowns every year. Despite his shorter career (just nine seasons), at least relative to the other players on this list, Johnson deserves to be in the top 10. From 2011 to '13, he was considered the best wide receiver in pro football, and perhaps outside of quarterbacks, the best player in pro football. "Megatron" was named first-team All-Pro all three of those seasons. Over those years, he produced three of the best seasons a wideout could hope to have, averaging more than 110 yards per game, while darn near eclipsing 2,000 in 2012. How he posted 1,331 yards and 12 touchdowns for an 0-16 team in 2008, and with Dan Orlovsky chucking him the football, is anyone's guess. He hasn't retired yet, which means Fitzgerald is a real threat to ascend this list rather quickly. He is already in the top 15 in receptions (1,018), yardage (13,366) and touchdowns (98). Really, it's the postseason when Fitzgerald has shined ... in nine career playoff games, he's averaged more than 100 yards per contest and at least one touchdown. His 2008 playoff run rivals any span by any player in NFL history: four games, 30 catches, 546 yards and seven touchdowns. Unreal. Much like Randy Moss, Owens is difficult to rank on this list. T.O. is second all-time in yards and third in touchdown grabs. Why is he not higher? Mostly because of the era he played in, and because everyone I've spoken with who was in the NFL during T.O. 's career said Moss scared them more from a scheme standpoint. Not to mention Moss in his prime was a tinge more dominant. Still, Owens could play with anybody, including the G.O.A.T. Largent was a model of consistency who held the career receptions, yardage, and touchdowns record at the time of his retirement. His prime years were spent with Jim Zorn and a developing Dave Krieg -- not exactly the King of Beers at quarterback (sorry, trying to give the now-retired Peyton Manning more plugs here). The former Seahawk posted eight 1,000-yard seasons, despite playing through two strikes. Remember that this was in the late 1970s and '80s, when the passing game was still inhibited, compared with today's game (where we have an illegal contact call every five seconds). Largent was named to the Hall of Fame's All-Decade team of the '80s. What Alworth was able to accomplish in the 1960s, given the rules of the day -- when defensive backs could bump receivers all the way down the field -- is remarkable. Alworth was the Moss of his day -- except more complete. He just wasn't as prolific late in his career. That said, "Bambi," as he was known, was the ultimate home-run hitter. 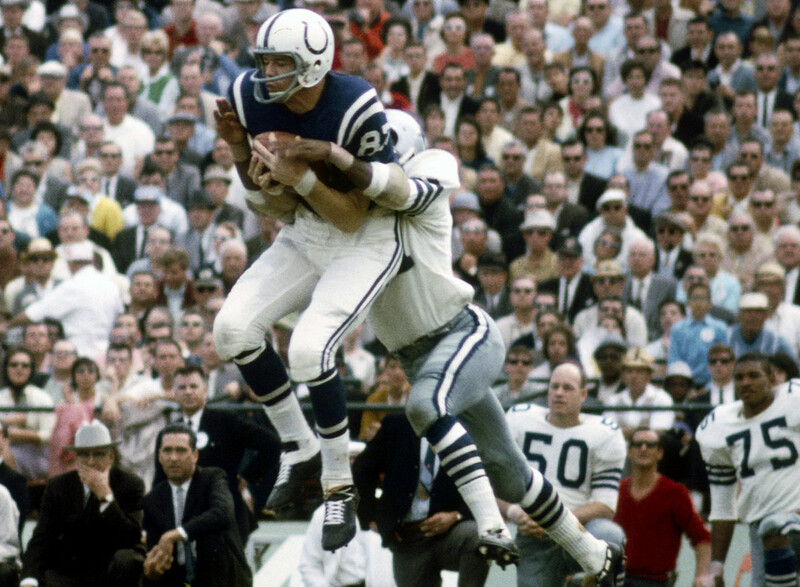 His 1965-66 seasons still might be the best back-to-back campaigns a receiver has ever had: In those two seasons, he averaged more than 110 yards and exactly one touchdown per game, at more than 20 yards per catch. Give me a break. He was the first true AFL player elected to the Pro Football Hall of Fame. Moss is such a difficult player to place, yet he was so dominant for stretches during his career that No. 3 feels right. During his first six years in the league, he posted more than 8,000 receiving yards and 77 touchdowns! That's Jerry Rice-level production. Most importantly, defensive coordinators were more afraid of Moss than any player in the NFL, with that fear surfacing his rookie year. The former Marshall product was as good out of the gate as any player in league history. ... Who could forget 17 touchdowns that season? Rice is often thought of as the top player in all of NFL history, but Don Hutson held that honor for the league's first 50 years. He, Sammy Baugh and Otto Graham were in the conversation for that prize then. Hutson's NFL record of 99 career receiving touchdowns was not surpassed until 40 years after he retired. When he hung 'em up in the mid-1940s, he had posted nearly twice as many receptions as the next closest player. The one criticism of Hutson is that he played when African-American players were not in the league. You can't blame someone for who they competed against. ... We don't knock Babe Ruth for this when talking about the best baseball players of all time. Rice is so far ahead of everyone in receptions (1,549), yards (22,895) and touchdown catches (197). Frankly, his records will never be surpassed, due to his productivity and longevity (20 seasons). His most impressive accomplishment might have been his 22-touchdown campaign in 1987, which he accomplished in 12 games! Rice combined work ethic, explosiveness at the snap (not 40 speed), a perfectionist personality and want-to to become the standard at the position.